Recently, I revisited Petamburan, spending a few hours in that high densely populated area in Central Jakarta that I had captured about three years earlier. To me personally, this place always generates the sense of Jakarta's urban living where people come from different walks of life. 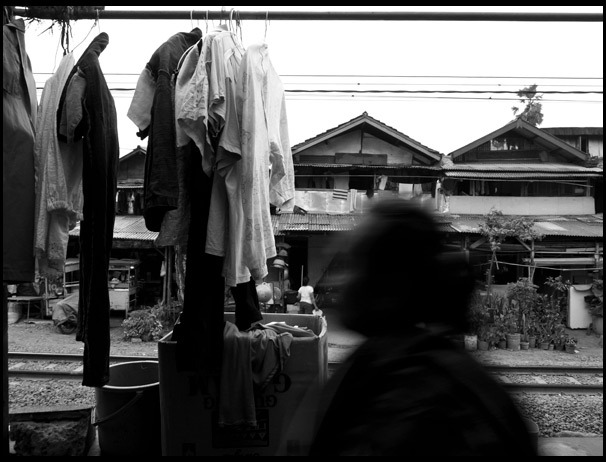 Walking along the rail road connecting Tanah Abang and Kebayoran Lama, we will meet people coming mostly from Central Java who struggle to set their footing in a big city of Jakarta. 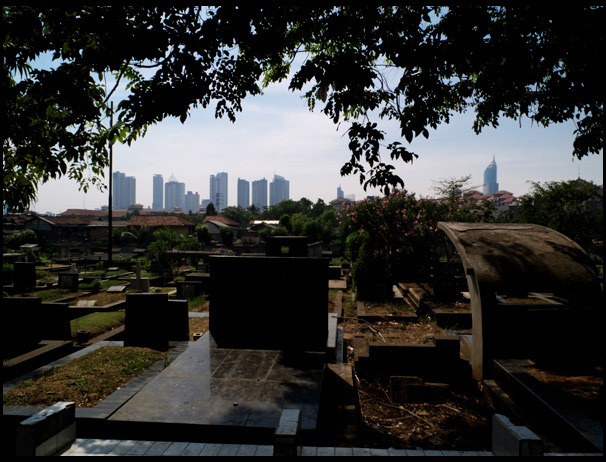 And, if we walk head to the west, we will find an old Christian cemetery which seems to be founded for the upper middle class during the late Dutch colonial years. These pictures below were captured during the short visit to those places. Thank you for coming. With the high rise tall buildings standing far away as the background, the old Christian cemetery is no longer a spooky place, even at night when those buildings are glittered with lights. From a distance, the settlement across the railways looked scary and unfriendly for a visitor. But as soon as we walked along its narrow corridor, the impression turned out to be different. Apparently, the people there had been accustomed to people coming with cameras. Pak Roup, together with his wife, whom my friend, Lukman Anas and I had a short conversation with in the so-called porch of his house that afternoon, came from Bumiayu, Central Java. Pak Roup had been living at Petamburan since 1991. It was the year he decided to move to Jakarta to try his fortune. Today, he worked as a construction worker. The skill everyone living close to the railways has to develop is how to sense when a train comes, especially during the rush hour like in the afternoon. 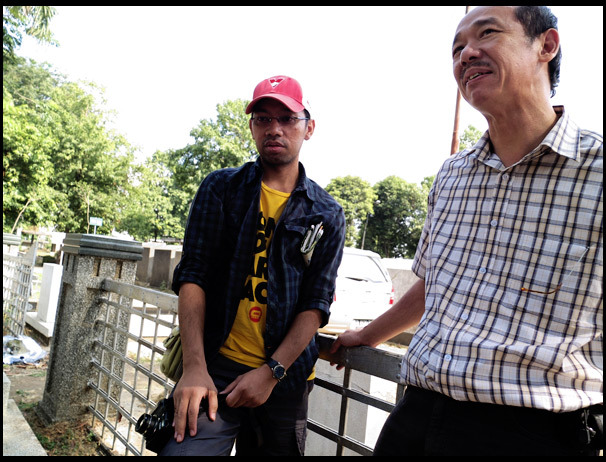 Stretching along the rail road that connects Tanah Abang with Palmerah, this settlement has for several times been covered by media. On the following morning, we returned for another shots. Taking a commuter-line-train from Cawang, we got off at the station of Tanah Abang and then rode a public car that delivered us to the old Christian cemetery at Petamburan. While passing through the cemetery, walking to reach the settlement that was located behind the cemetery's wall, we couldn't help but notice that there was one Chinese familiy gathered, holding some sort of ritual at one grave, sited inside the fenced area in which a big mausoleum was erected to house the urn of the family of Khouw Oen Giok, - a very wealthy and influencing man, passing away 85 years ago. We wondered if they were the descendants or had a family relationship with the man. Curious but reluctant, we approached one of them and kindly asked the question. It turned out that they didn't have any relationship with the wealthy man. The fenced area which was supposed to be preserved only for the mausoleum has today become site of tens of graves due to the lack of space at the cemetery. The family shared some valuable information about the ritual they were holding that day. Sadly, I didn't take a note. The only thing I could still recall was that it was the seventh month of Chinese calendar and they regarded it as a period where the gate of hell was opened and all devils and bad spirits were released to wander on earth. They came to the grave of their families with offerings like foods (preferably those favoured by the deads during their life time), fruits, and stack of yellow papers - symbolizing 'money' - that they were going to burn as a way to send it to the deads. A question popped up out of my head. If it was the devil and bad spirit who were released from hell, why would they send offerings to their dead families? Well, despite the fact that most Chinese descendant in Indonesia have today embraced Christianity and Catholics, the practise and thoughts of Confucion are still largely preserved. They were somehow afraid of bad karma that could fall on their parents in their next incarnation.What they did on that day was simply to cleanse the souls of the dead from the sins. As for the ritual, it was commonly known as Sembahyang Rebutan. 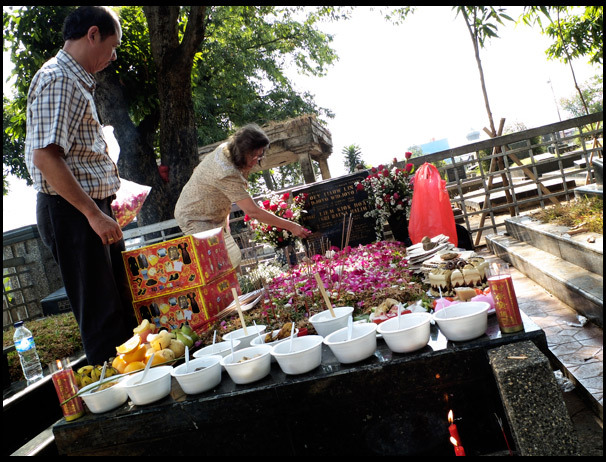 The family of Oei Tiau Lin was gathered to send prayers with offering to the ancestor. 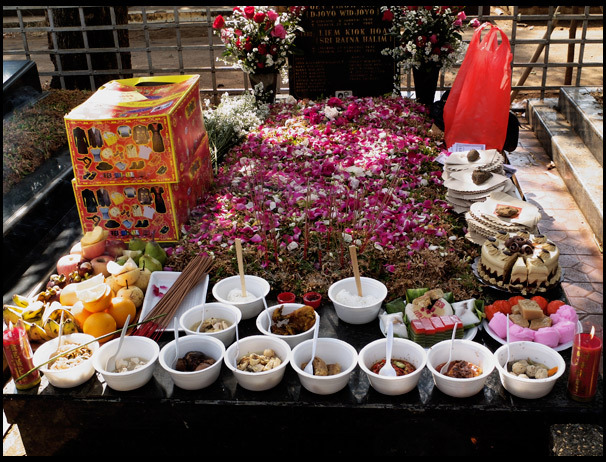 The foods in the offerings symbolized the three elements of earth. Vegetables and potatoes were for soil, fish and seafood for water, and chicken (bird) for air. Every Chinese grave was adorned with an ornament like this box, placed on the ground where a joss sticks was burnt to honor the earth. Pak Rusdi, who paid honor for his late father, told us that the young generation today did no longer conceive the idea of Sembahyang Rebutan. They came to the grave just to show respect for the ancestors. 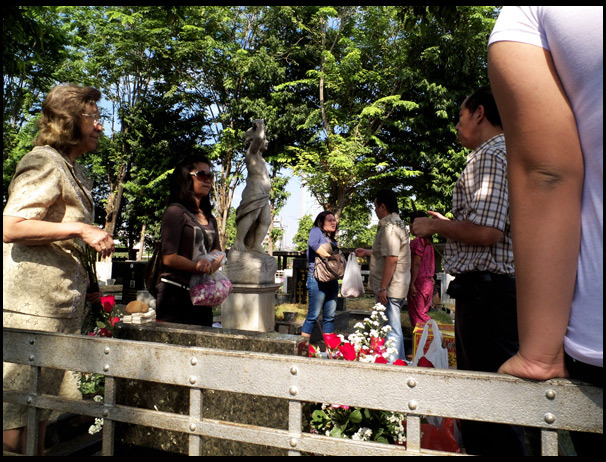 Walking few blocks away from the fenced area, we met Pak Gunawan who came with his wife and son to say prayers over his late father's grave. Having a conversation with the man, I became a little bit excited to find that we shared a common perspective on the history of Islam in Indonesia. We both were convinced that eight out of nine "Wali Songo" were Chinese. In other words, Chinese traders played a very significant role in spreading the teaching of Islam, particularly in Java. Shortly after that, Pak Gunawan started the ritual of sending 'money' by burning a stack of yellow papers, folded like napkins. Two coins of five hundred rupiah were tossed to find out whether the spirit had agreed to start the ritual. Had those coins come up with head and tail, the spirit wouldn't have wanted it. Both coins should come up with either head or tail. 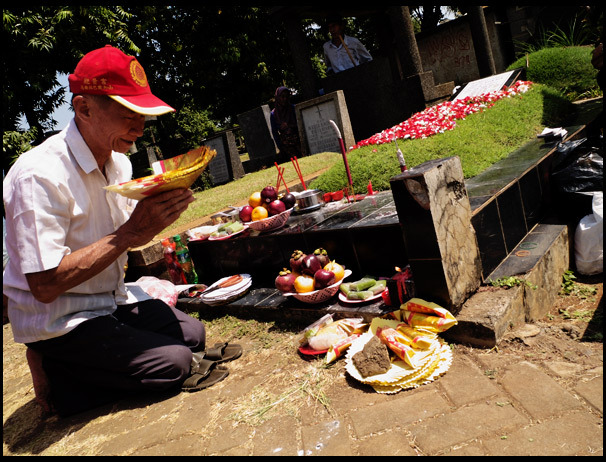 Pak Gunawan had to toss the coins twice before the spirit let him do the ritual. 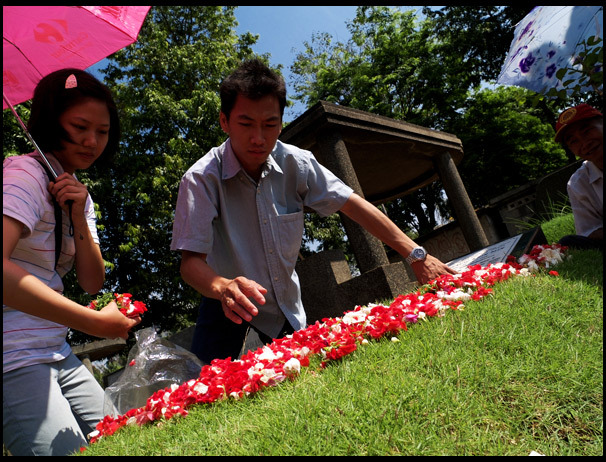 Under the eyes of the father, the children of Pak Gunawan sowed flowers over their late grandfather’s grave. For most young generation today, this kind of ritual is merely an obligation of showing respect to the ancestors. 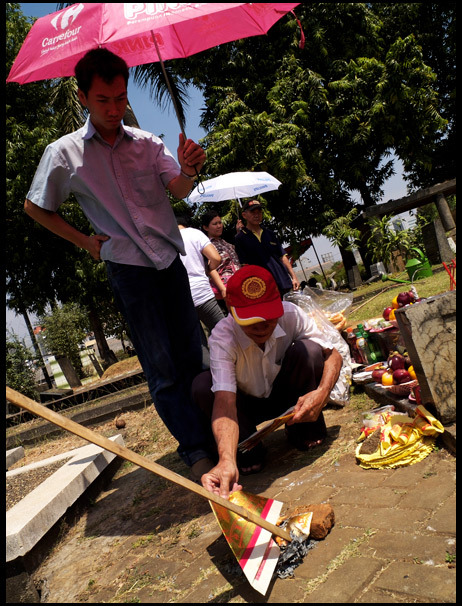 Together with his son, Pak Gunawan burnt the yellow papers as a symbol of sending money to the spirit. 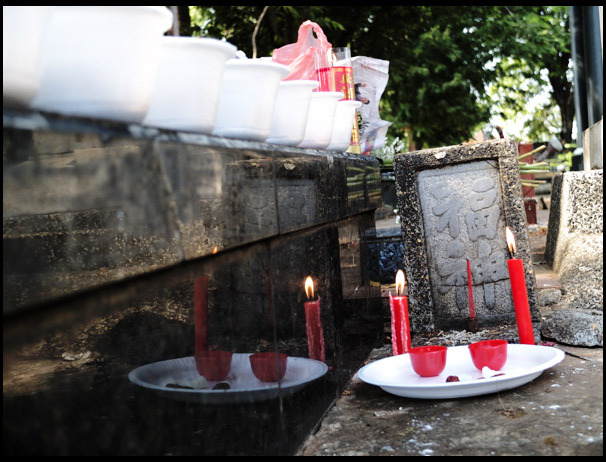 As we walked to leave the cemetery, many more Chinese families came to hold the ritual of Sembahyang Rebutan, while the children and women from the settlements behind the wall were waiting for some sort of donations paid by the families.